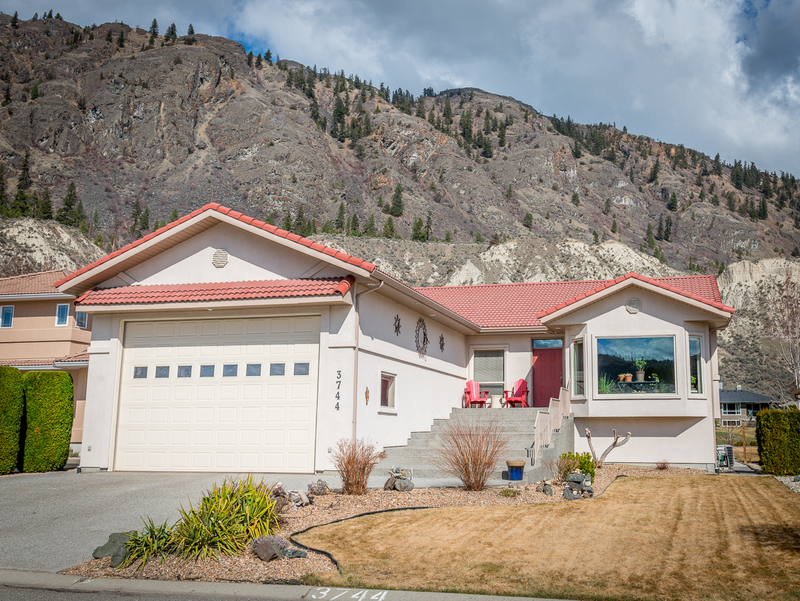 New Listing: 3744 Navatanee Drive, South Thompson Valley, Kamloops, BC $619,900. Fabulous one level living close to the City but nestled in private setting at Rivershore Estates. This fully finished home offers over 3,800 sqft with 2 bedrooms up and 2 down. Open concept kitchen and dining room integrate outdoor entertaining with large covered deck. There’s a natural gas BBQ and backs onto the fourth Tee Box. Vaulted ceilings in south facing living room has tons of natural light and a gas fireplace for those cooler evenings. New engineered hardwood throughout and fresh paint makes this home totally ‘move in ready’. King-sized master bedroom boasts spa-like 5-piece ensuite and full walk-in closet. Second bedroom or excellent Home Office, 4-piece bath, laundry and garage entry completes the main floor. Lower level offers 2 additional bedrooms, cozy family room with wet bar, large wine cellar or hobby room, access to garage and loads of storage. Oversized 2-vehicle garage with 12′ door and side garage entrance for golf cart, ATV or side by side. Clay tile roof, 200-amp service, underground sprinklers, central air conditioning and central vacuum. 24-hours notice appreciated and quick possession possible. Bareland Strata Fee $202.00/month.